I could not have been anymore excited when Tracey reached out to book a family session with her two girls! 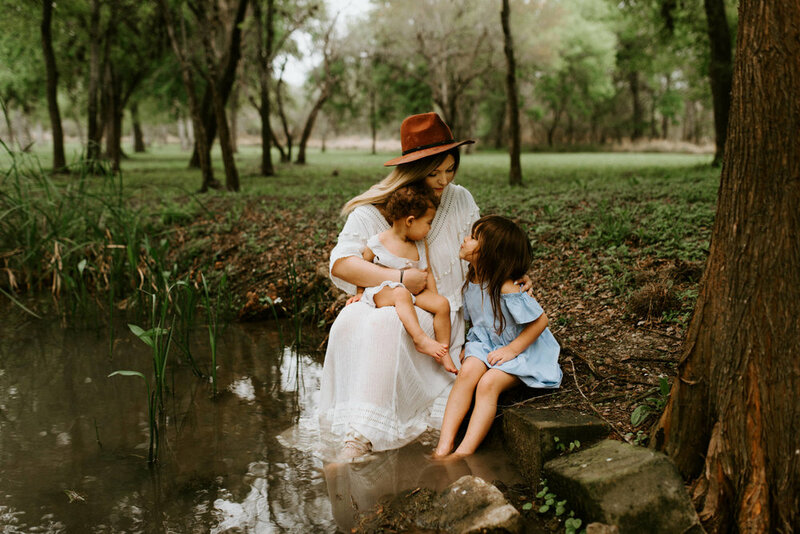 She wanted some newer portraits with both her daughters and to document her breastfeeding journey with her youngest. I had photographed Tracey with her oldest daughter a couples years ago, and I knew a little spot on the creek that I thought would be perfect for her adventurous toddler and for her breastfeeding photos! It was a beautiful overcast day when we arrived, the grass was so green, the water was rushing downstream, and birds were chirping all around. I loved the way her youngest held her momma tight while her oldest bravely hopped in and out of the water! They tried to catch some little toads, gave lots and lots of kisses to one another, and we ended our day picking some wild bluebonnets. I absolutely love exploring the Corpus Christi with little ones and their parents, these moments that they spend together are everything I love to capture!